A super simple, but inviting fall themed sensory bin for toddlers and preschoolers that encourages the development of fine motor skills. There's just something about playing with water. My kids cannot get enough of it. 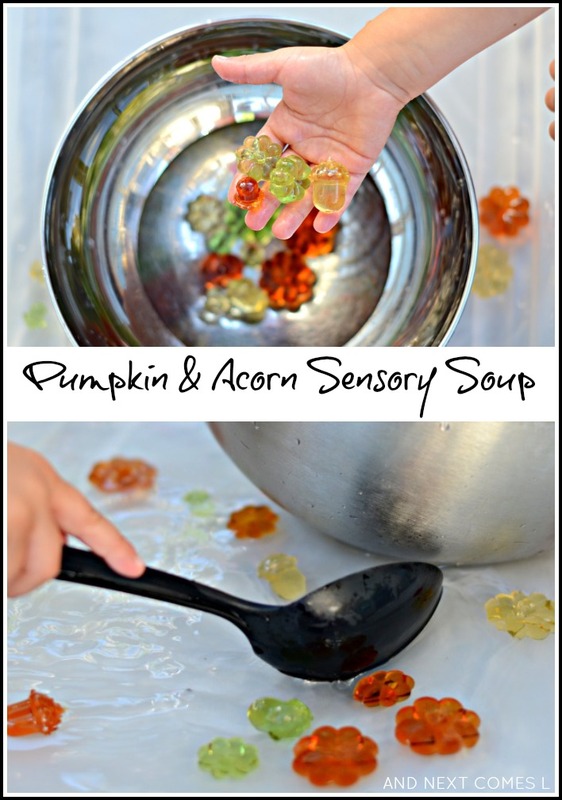 So simple water sensory bins like this fall inspired pumpkin and acorn sensory soup are our go-to boredom busting activities. It requires no prep to set up, but this sensory bin encourages lots of fine motor skills and pretend play. It's also a lovely way to explore the colors of fall. Acrylic pumpkins and acorns - You can find it at the dollar store and Michaels. Kitchen utensils: large spoon, ladle, and whisk, but you can include measuring cups, measuring spoons, and more! Like all of our sensory soups, we simply just dump the materials into a large plastic bin and it's ready for playing. My boys particularly enjoy scooping up all the water that they can using the large spoon and ladle. They usually aim to fill up the bowl that I supply, simply so they can dump out all of the water. Scoop and dump. Scoop and dump. And repeat. Look at all the bubbles!